Rants, half-truths, fake news – that’s what many people might think is what appears on the Real Donald Trump Twitter page. Alternatively, many people believe that what Donald J. Trump writes on Twitter speaks for them; they identify with much of what he says. One thing is for sure; you cannot mistake what he thinks or believes. The President’s psyche is on full display in his Twitter stream. Other politicians, though, are less open in their approach to social media. They post things which you might consider to be “professional”. They don’t “let it all hang out” on Twitter, as President Trump does. 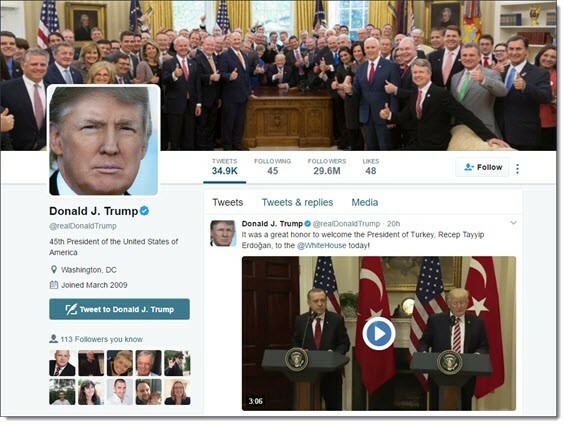 New research on the political use of social media, however, shows that what Donald Trump does is much more likely to attract people. The “professional approach” appears somewhat off-putting online. The study was conducted in Sweden and the UK and investigated the Twitter activity of 265 politicians. The researchers were interested in finding out if there was any connection between a politician’s Tweets and support for a political party. What the academics discovered was a clear connection between one particular kind of Tweet and support for the party. It turns out that when politicians are not just “professional” but mix their personal views and life with their political career, that’s when parties get the most support. This is all about “self-presentation”. It seems that we are much more attracted to individuals on Twitter who are “whole”. They present themselves, in full, rather than just one side of their world. We like people – and favourite their Tweets – when we can see they are “complete”. Donald J. Trump exudes this “wholeness”. There is no mistaking what he thinks, what he is doing, who he likes, who he dislikes – in politics, business and his life generally. Can business learn from this? What this study has shown is that social media activity makes it evident what kind of person you are. It is crystal clear whether someone is Tweeting just about work, or solely on a given topic. That shows us, pretty quickly, that they are not entirely truthful about who they are as a person. We can see that they are hiding things from us because there is nothing about them personally on their Twitter stream. Politicians argue that they need to separate personal from professional, as do many business leaders who Tweet. The problem is, the personality they are showing in this way is so clearly one-dimensional and, therefore, apparently not “whole”. The result? We don’t like such individuals as much as we like those who are “complete” showing their professional and business side. Their self-presentation is obviously whole. For business leaders who Tweet this means that separating business from personal is actually working against them. It is making it tougher for them to get Retweets, or Tweets marked as favourites. That happens mostly when the self-presentation of an individual is “whole”. The researchers say, “general users who communicate with diverse audiences through social media should consider adopting a balancing strategy to maximize the beneﬁts of their network. Our studies suggest that the balancing strategy provides an alternative and more positive approach to online impression management, as opposed to a rather defensive self-censorship tactic.” They are backing up data from earlier studies which showed that engagement on social media increases when users can see they are dealing with a “real person“. Separating business from personal appears to weaken your social media impact. People want to see the “real you”, not just one side of you. Improve your social presence by mixing business and personal. Show the whole you, says study.